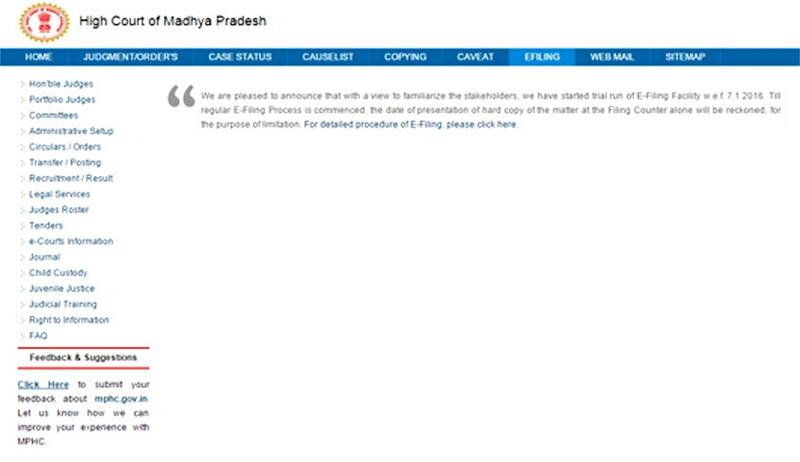 Lawyers in Madhya Pradesh are now allowed to directly register fresh cases online on a multipurpose e-filing system on the High Court’s website. The High Court on Tuesday activated user accounts of lawyers with an aim to reduce its staff. In the first phase of the procedure, lawyers are required to register their fresh cases personally on a document available on the website. Through their user accounts, lawyers will get regular updates on their pending cases for which the IT cell of the HC will soon create a case profile. A lawyer’s license registration number, e-mail address and mobile phone number mentioned on the vakalatnama filed with cases will be treated as authentic and subsequently the password of unique user account generated by the IT cell will be sent on the mobile number. On filing a fresh case online, a lawyer will get an online registration slip which needs to be submitted with the original petition in the court’s filing section for hearing. For pending cases, the IT cell is in the process to scan documents of replies, rejoinders and applications filed by the parties. At present, 250-300 new cases are registered daily in the MP High Court including the Principal Seat at Jabalpur, Circuit Benches at Indore and Gwalior. User accounts of 20 lawyers were created on Tuesday and work is on to create more such user accounts. For access to the official e- filing registration on the HC website, click here. The practice directions for E-Filing (phase-I) of Cases in the High Court of Madhya Pradesh will be effective from the dates notified by the Hon'ble The Chief Justice of the High Court of Madhya Pradesh from time to time. These practice directions will not affect the regular filing of a case in the High Court of Madhya Pradesh. The E-Filing (phase-I) is only for Advocate on records registered at Bar Council of Madhya Pradesh. First time users of High Court E-Filing (phase-I) have to register his/her E-mail ID and Phone number at the e-Counter in the Filing Counter open at Principal Seat Jabalpur and its Benches Indore and Gwalior. Click on E-Filing tab/icon on the front page of the website. On opening the new page, click new user registration. You will be directed to the registration page where you can register as an Advocate. On the Registration page, enter your Enrollment Number and Year. After submitting the button of signup on the registration form, an OTP password is forwarded to your mobile number and e-mail id. Again go to the login page i.e. www.mphc.gov.in/?q=user, enter your login name and password forwarded on your mobile number and e-mail id. After submitting the login button, you were directed to the e-filing page where you get the details of old cases filed by you and filing of new case. (i) Filing. (ii) Indexing. (iii) Lower Court. (iv) Additional Party. (v) Additional Advocate. (vi) Court Fees. (vii) Limitation. (viii) Generate ID.